My friend Andrea's son is a friend of Eli's--he is going to be flying for the first time soon, and he was pretty nervous about it. He's a VERY smart kid, and I had a feeling that if he was able to talk to a pilot about how things worked on the airplane, he would feel more comfortable about his first flight. As you probably know, my brother, Brian, is a pilot for Delta, so I asked him if he would mind chatting with Andrea's son. Brian is in the process of moving to Michigan, so he's been here a lot lately working on his house (he and his wife bought a foreclosure, and they are remodeling). He agreed right away, and thought it was so cute when Andrea's son said, "I never thought I'd be talking to a pilot. Like, ever. It's absurd." Hahaha. So, I picked up the kids from school and Brian came over, wearing his uniform and everything. Today, I had another speed workout on the schedule: 12 x 1:00 at faster than race pace. My race pace is 7:55, so on my "fast" workouts, I try to aim for 7:50 or better. Since these were just going to be one-minute intervals, I decided to push the pace kind of hard, and aim for sub-7:00. (The roads are still icy, so I was on the treadmill again). 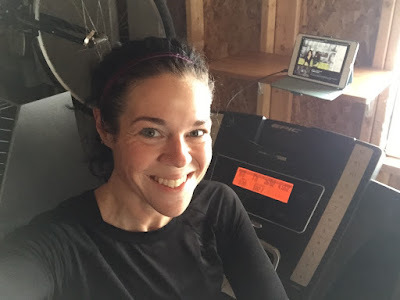 I ran a 10-minute warm-up, and then set the treadmill to 8.6 mph (a 6:59/mile pace). The first 30 seconds or so of the interval was a piece of cake. Then, of course, it started to feel harder. Knowing I was only running at that pace for one minute, though, made it very bearable. I did the first eight intervals at 8.6 mph, but my heart rate still wasn't getting up to 95%. Over the next four intervals, I increased the speed by 0.1 mph, so I did the last four at 8.7, 8.8, 8.9, and 9.0 mph (which is a 6:54, 6:49, 6:44, and 6:40 minutes per mile pace). If you can't tell, I'm watching Gilmore Girls on my iPad. LOVE THAT SHOW! I was kind of bummed to see that my foot pod showed me going slower than that, between 7:02 and 7:30. The interesting thing about calibrating the foot pod is that it can be spot-on for running at 6.0 mph (the speed that I calibrated it at), but then when I change to 5.0 or to 7.0, the calibration is off again. Between intervals, I just hopped off the treadmill and rested until my heart rate dropped down to 136. Since the intervals were so short, there was no point in changing speeds every minute. Over all, the workout went really well--almost too well. Next time, I'll try and do all of the intervals at 9.0. Jerry and I bought Powerball tickets for yesterday's drawing (we've only ever bought tickets maybe three times, but since it was such big news, we just had to). We were talking about what we'd do with the money if we won, and I kept thinking of all the things I wanted to buy for other people: I'd want buy my dad a new boat, my mom a new car, pay off mortgages for all my family, send my siblings and friends on dream vacations, etc. Most of all, I would want for Jerry to not have to work another day in his life! I'm glad you got to hear your brother talk about flying. My husband is an aerospace engineer and I hate flying but listening to him explain all the math and testing and planning that goes into building a plane I feel confident that they're not just thrown together haphazardly. My problem with flying is just the other people. I have anxiety in crowds of people so being trapped inside something with a large group of people (especially with everyone sitting so close) is more than I can handle. Someone from our county was one of the winners, and everyone is going nuts. I can't help but think at some point he'll wish he hadn't won. I'd love to know about that iPad stand you have. I don't have a treadmill but I do have a bike trainer and an hour on that is seriously boring. Or maybe it's a shelf? Jerry just hung a piece of wood in the garage to make a shelf for my iPad. I can't stare at the wall for an hour! Watching Netflix is the best way to pass the time on the 'mill. That is crazy about the chicken...you learn something new everyday don't you? That is so cool that your brother took the time to talk to the boys about flying! Oh and I just got a new treadmill from sears.com and they have great deals plus no interest for 24 months!! I paid 700 for a 1500 treadmill!! Me: The weather looks cloudy--is that bad? Can pilots see in fog? I think it's too foggy! What if it rains? OH GOD, they are de-icing the plane! What if the wings freeze during the flight? Brian: The pilots know what they are doing. They are trained for this. Me: Okay, you can go back to sleep now. Sorry to wake you. So funny you mentioned the chickens. One of my friends was a test engineer in the GE jet engines division. One of his jobs was shooting frozen chickens out of an air cannon into the running engine. Your brother is totally right. My dad is a piolt for American Airlines but he has flown for small compaines as well. He loves flying! I still remember when he would take us into the cockpit!